Looking forward to baseball season in 2019? Then look ahead at the just-released schedule for the Colorado Baseball Series at Triple Crown Sports. Starting with the March 9-10 Droughtbuster and extending through the July 12-14 Colorado State Championships, the professional staff at TC Colorado Baseball will be there every step to make sure teams and families have a rewarding spring/summer run. We’ve rolled prices back on multiple events, and there’s an Early Entry Discount available until Jan. 7, 2019. And of course, baseball in Colorado is not complete without our two sessions of the World Series in Steamboat Springs – July 23-28 and July 30-Aug. 4. Through Dec. 1, Colorado teams can seize a 25% Early Entry Discount for these two events. We are excited to welcome Matt Reed to the Colorado Baseball Division. Matt comes to us from Florida where he spent 10 years coaching baseball at Webber International University; he spent the summer of 2018 busily working multiple TCS events to become more familiar with our systems and procedures. Matt also spent time at Webber as Event Manager, where he was in charge of all home sporting events. After his Webber days, Matt spent two years as the head baseball coach of the Colorado State University club team, leading them to a runner-up finish at the NCBA World Series. Prior to his coaching career, Matt played three seasons in the Minnesota Twins minor league system. ​The 13u Yard Dawgs stormed the field with confidence on a gloomy Sunday afternoon in Windsor, CO., at the Colorado State Championships. The team tallied just one loss in the tournament, which came from Friday’s pool play game against the Chargers. The Dawgs redeemed themselves by run-ruling the Chargers in bracket play and eventually fought their way to the title game where they succeeded in taking down the undefeated 5280 Tigers, 7-1. “Friday, the boys came out a little flat and frankly didn’t play that great. So we came back out yesterday and today with a better approach and mentality,” said head coach Jason Bates. While the Tigers seemed to have the initial advantage by being home team and having a perfect record, they had yet to play the Dawgs in the 2018 season. This presented a clean slate for the matchup and it was truly anybody’s game. An unusual start put the Dawgs on the board 1-0 in the first as the Tigers starting pitcher struggled to find the zone and hit four consecutive batters with wild pitches. “I thought it gave us a lot of momentum when all of us got on base right away,” said leadoff batter Dominick Cortez. More Tigers pitching struggles resulted in two free bases to start the second inning. Cortez stepped up to drive in a run and teammate Conner Boyd did the same as he found the 5-6 hole and extended the Dawgs lead, 3-0. The score remained that way until the fifth when Boyd crushed a leadoff double and quickly scored on a Tigers throwing error. The Dawgs offense scraped in a few more insurance runs in the sixth initially led by Finley Bates’ single. Bates was brought around to score on a hit from Braden Doumer and another single from Nathan Pitts put two ducks on the pond for Cortez. He was clutch once again and cleared the bases by smashing a triple to the right field fence. Cortez tallied three RBI in the game, scoring nearly half of the Dawgs total runs. “I knew that I had to do it for my team because I struggled yesterday. So I just had to come back today and show up for them,” said Cortez. The Dawgs had a comfortable 7-0 lead heading into the final two frames. The Tigers scored a run in a sixth inning rally but it wasn’t enough to catch the Dawgs. “The game plan going in was to get our starter Hunter Gotschall to four or five innings and see what happens from there. If he’s throwing strikes and on his game that always gives us a chance,” said coach Bates. Gotschall did his job on the mound, throwing an absolute gem for the Dawgs. He recorded eight strikeouts, allowing just two hits and held the Tigers scoreless through five full innings before closer Conner Boyd entered in the sixth. 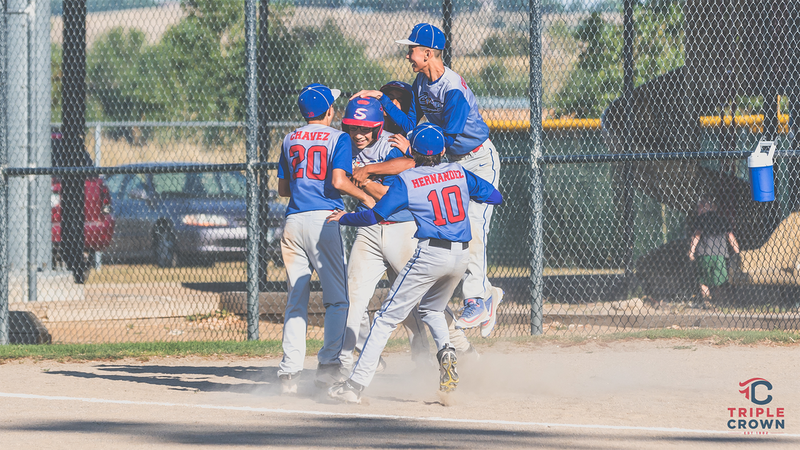 Colorado Elite entered the 12u D1 title game of the Colorado State Championships with plenty of confidence and plenty of reasons why. Scoring 46 runs in pool play and claiming the No. 2 overall seed, Elite proceeded to cruise through the semifinal with another impressive double-digit victory over the CC Bruins, 12-2. Sunday afternoon at the Ballpark in Erie, Elite faced the No. 1 seeded Colorado Burn. Though the Burn edged Elite’s effort in pool play, Elite walked away as champions, claiming the 12u D1 crown, 14-0. Leadoff hitter Brooks Barber got right down to business in the opening frame. Barber singled to start off the inning, moved to second on a passed ball and would come around to score on an RBI single from Gavin Smith. Smith would later equal Barber’s scoring effort when Adam Smith brought both him and Matthew Casillas home to top off a three-run first inning. After his work at the dish, Casillas turned his focus to the mound. Though Burn would record a hit and a walk, those would be the only two batters that reached safely in Casillas’ body of work. The young right-hander completed three full innings, gave up just one hit, and struck out four. In the top of the second inning, Elite put the pedal to the metal offensively. Ten of the 11 batters in the order came to the plate and by the time the dust settled five runs had scored. Elite saw RBI come from Will Garduno, Dominic Gamueda, Luke Garner, Gavin Smith and Brooks Barber. With Casillas rolling on the hill, Elite went back to work in the third inning already leading 8-0. It was the same song, different inning as the boys from Parker plated another five runs, running away from Burn, 13-0. Elite added yet another run in the fourth inning before coach Smith turned to Luke Garner to seal up the championship. Though Garner didn’t have the sheer number of innings to work with as Casillas, his efforts weren’t dissimilar, recording two strikeouts, including the final swing and a miss to claim the 12u title, 14-0. Finishing at the top of the pack in the Triple Crown Colorado State Championships has been no strange feeling for Elite in the recent past. Their 2018 title is now the second of back-to-back championships. “We love playing in this tournament,” said coach Smith. “Not only have we had some recent success these last couple of years but it provides us with so many things. 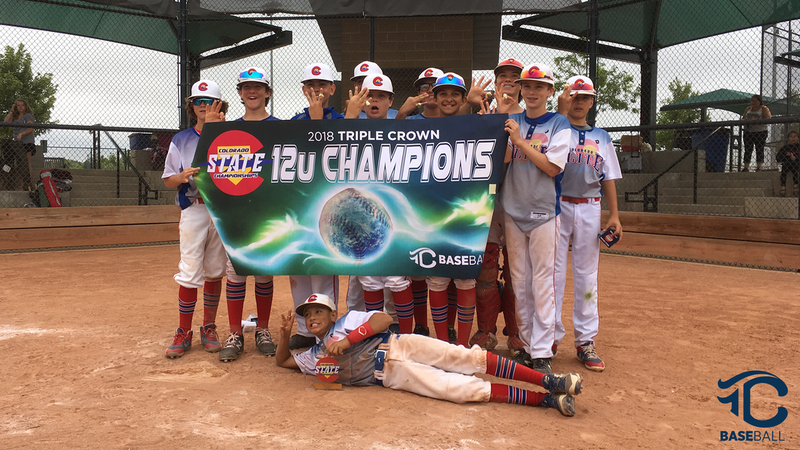 Thornton Storm Red were cruising through pool play in the 13u D2 division of the 2018 Triple Crown Colorado State Championships with double-digit wins over Thunder Bats and Gameday Elite. When the Storm dropped its first game to Slammers-5280, Storm Red needed a win over Diamond Club Navy to ensure themselves a spot in Sunday’s bracket play. Trailing almost the entire contest, the Storm conjured up some late-game heroics to win in walk-off fashion, 7-6, locking in the No. 1 seed in the Gold Championship bracket. Diamond Club struck the first blow, dialing up two runs on four hits in the top half of the first inning. Before things got out of hand, catcher Roman Padron worked hard to calm down starting pitcher Matthew Hirschfeld. As Padron instilled more and more confidence in pitcher Hirschfeld, the right-hander picked up steam, knocking down Diamond Club in order in the top of the second. The Storm began to chip away at the lead in the bottom half of the frame. Bryan Gutierrez began the effort with a single and would later score to bring Thornton within one, 2-1. Diamond Club countered with two more runs in the third inning, stretching the lead to three, 4-1. The resilient Storm had yet another answer, however, bringing in a run on a Padron RBI single. Padron would strike again in the fifth inning. Still trailing 4-2, Padron found a gap through the middle for the second of his two RBI. He would finish the day 2-3 with an intentional walk. After Diamond Club added another insurance run in the top of the sixth inning, Thornton was running out of time to mount a comeback. Gutierrez, along with Daniel Gomez and Dominic Chavez sparked a three-run inning, leapfrogging Diamond Club for the lead, 6-5. Tensions rose in the final frame when Diamond Club plated a game-tying sixth run. With the bottom of the order due up for Thornton, the Storm needed a special moment one last time. Nathanial McGill led off with a single, stole second and scampered to third on a Joshua McKee bunt single. With Padron earning a free pass to first, the bases were loaded with no one out and Ethan McCormick at the dish. As everyone at the Louisville Sports Complex rose to their feet, McCormick singled to left, ending the game, 7-6, and secured the Storm a spot in Sunday’s bracket play. Thornton awaits the winner of the TC Wolves and Windsor Wizards. Three more wins are all that separate the Storm and a 13u D2 Gold title. 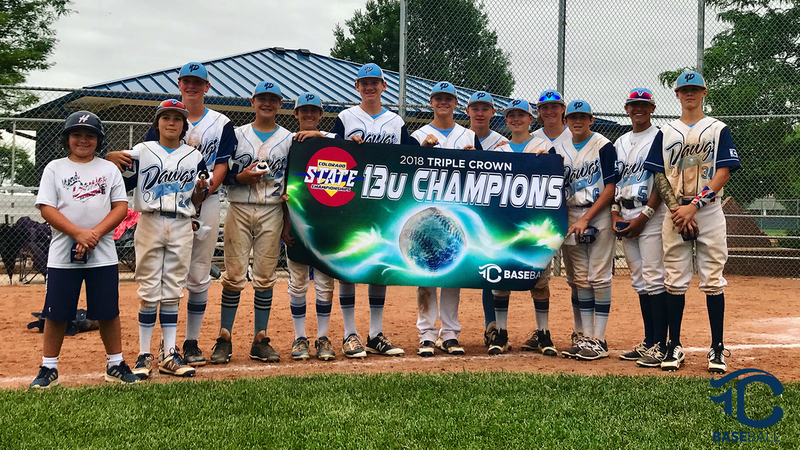 Nothing has come easy for the Colorado Steel in the 13u D2 division of the 2018 Triple Crown Colorado State Championships. 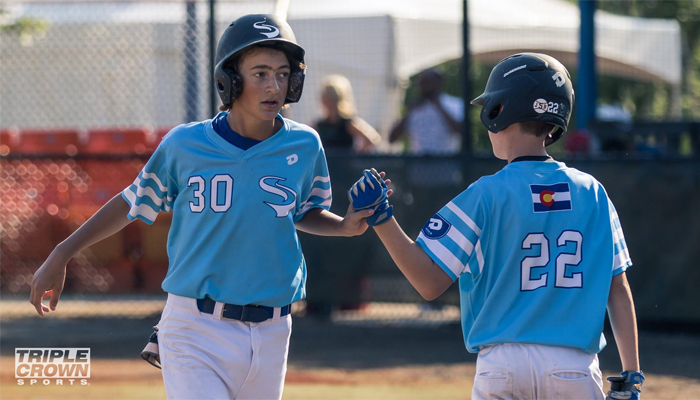 The Steel’s route through pool play featured a 3-0 Gameday Grinders team, the 1-1-1 Parker Colts, a then-undefeated Slammers Wolverines squad and a fourth tough matchup against a Colorado Altitude team coming off a six-run victory. Though the Steel held the lead in six of the seven innings against Altitude, they would settle for a second tie in pool play, 6-6. Jonathan Gonzalez kicked the game versus the Altitude off with a single in the top of the first inning, sparking a three-run frame. Braxton Vail delivered one of the RBI on what was part of back-to-back-to-back hits for the Steel. Lead in hand, the Steel turned to Isiah Martinez to keep it the game in their favor. Martinez, not the biggest athlete in terms of stature, relied heavily, and quite successfully, on his defense. Martinez masterfully crafted four innings, giving up just three runs and striking out two. The stellar Steel defense behind him combined for 10 putouts and turned a momentum-killing double play in the bottom of the fourth inning. Before Altitude squeaked a third run past Martinez in the bottom of the fourth, Vail came through with his second RBI in the top half of the inning to give his team a little insurance. Leading 3-2 and leading off the inning, Vail launched a towering home run to the opposite field in left, stretching Steel’s margin, 4-2. The fifth and sixth frames were patrolled by middle reliever David Ortiz. After a quick fifth inning, Altitude struck with a two-run home run in the sixth, taking the lead, 5-4. In the final frame, the Steel’s bottom half of the order shined, garnering two hits, a trio of stolen bases and a lead-changing RBI from Isiah Martinez. With the lead recaptured, the Steel stood just three outs from its first victory of the tournament. Altitude was not about to a win slip away just yet, though. A pair of errors led to a run before Zach Mehess could record the final strikeout, ending the game, 6-6. Steel’s second tie leaves them with a 0-2-2 record in its four pool play games. Without a win, Steel’s chances of making the championship bracket remain slim but the team is looking at the positives. ​Offense has not been a problem for the Fort Collins Force. 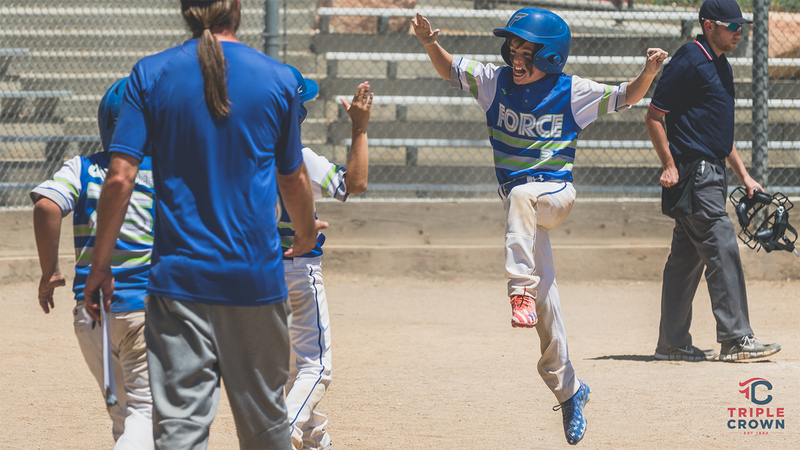 Tallying 31 across its first two games, the Force took care of Slammers Prospects, 17-10, and finished off Dirtbags Baseball, 14-4, to sit atop Pool A in the 10u D2 division of the 2018 Triple Crown Colorado State Championships. 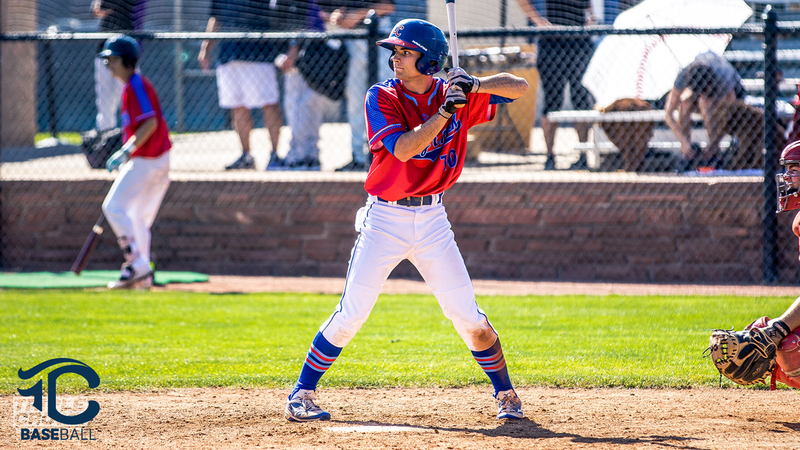 Fresh off an impressive victory against a Slammers team that was coming off a double-digit win themselves, Fort Collins was looking for a hot start to kick off Game 2. After shutting out the Dirtbags with a 1-2-3 top of the first inning. Batinger led the bottom half of the frame off with a single, stole both second and third and came around to score on a passed ball. Max Fowler would also score in the inning, giving Fort Collins an early 2-0 advantage. The Dirtbags struck back in the top of the second inning. Scoring two runs on two hits, the Greeley-based squad leveled up the game with four innings to play. Working quickly in the bottom of the frame, the Dirtbags took the lead for the first time of the day in the top of the third, pushing one run across. Cox’s squad came into the bottom of the third with the exact mentality the coaching staff desired. Fort Collins sent 13 batters to the plate in the inning, scoring nine runs in breakout fashion. Noah McFarland along with Ian Sanderson and Wrigley Cox each came up with an RBI to stretch the Force’s lead, 11-3. On defense, the Force made use of three different pitchers who all relied heavily on the players behind them to keep the lead intact. After the Dirtbags tallied a fourth run in the top of the fourth, Fort Collins needed an extra three runs to close a second consecutive win. Batinger came through once more with a single and a run scored off Fowler’s RBI hit but it was Sanderson who delivered the decisive blow with an RBI single to seal the game, 14-4. The Force face two more pool play games on Saturday before the championship bracket begins on Sunday. With its two wins and high run differential, Fort Collins has a strong hold on the No. 1 seed in Pool A. What better way to honor our troops than to play America’s favorite game on Memorial Day Weekend? Triple Crown Baseball hosted another successful Memorial Day Classic in Northern Colorado this past weekend. The event featured 83 teams in 9's through 14’s age divisions. The 4-game guarantee started on Saturday and continued through Monday and there were various levels of play offered including Division 1, 2, 3 and combo divisions as well. Congratulations to all of the teams that earned the hardware, and thank you to all those men and women serving this country so we can feel safe and enjoy the great game of baseball! Lucky for our lawns, northern Colorado received plenty of spring showers this past weekend, however it wasn’t the ideal weather for a baseball tournament. Regardless, Triple Crown Baseball toughed it out to put on The May Melee in Longmont, Firestone, Johnstown and Greeley. The event featured 70 local Colorado teams as well as a few Wyoming clubs across the 8u-14u age groups and D1, D2 and D3 divisions. It clearly took a lot of help and hard work to make this event happen so big thanks to the NoCo facilities staff and our Triple Crown staff. And congrats to the teams who suffered the chilly weather and rain delays and were rewarded with a championship trophy at the end of it all. ​The Wolfpack Ninja Tour is bringing the emerging sport of Ninja Obstacle Racing to fans, athletes and fitness enthusiasts far and wide. The next big thing in cross-sport athletic training presented in an adrenaline pumping competition event is as entertaining as it is effective, plateau-busting physical conditioning. Triple Crown Sports is pleased to support the broad goals of the Wolfpack Ninja Tour, which highlight the core values of social responsibility, fighting childhood obesity and getting kids moving, and creating spectator sport entertainment that will bring out the athlete in everyone. 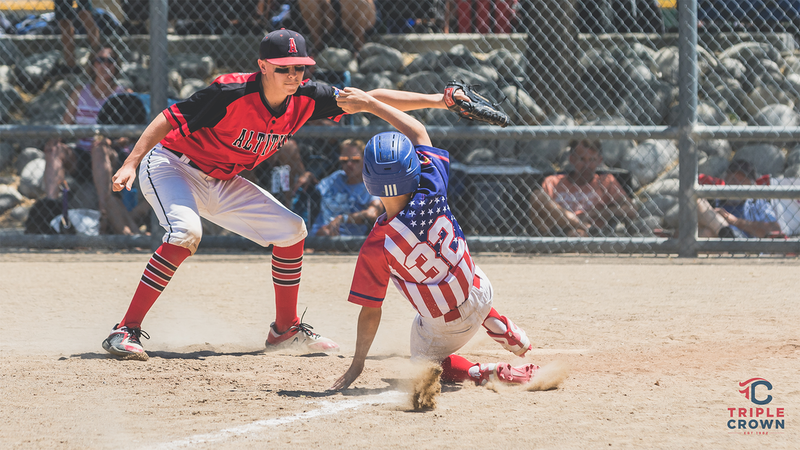 Health and fitness, and a love for competition, are essential priorities for athletes taking part in Triple Crown’s baseball and softball events, making the message of the Wolfpack Ninjas relevant in all ages. “The goals of the Wolfpack Ninja Tour are simple. First, we want to make the world healthier one kid at a time. Second, we want to provide Ninja sport to a whole new generation of kids. And third, we want to instill seeds of greatness, self-dedication and obviously nutritional habits that are going to last a lifetime.” -- Wolfpack Ninjas President and Co-Founder, Dr. Noah Kaufman. 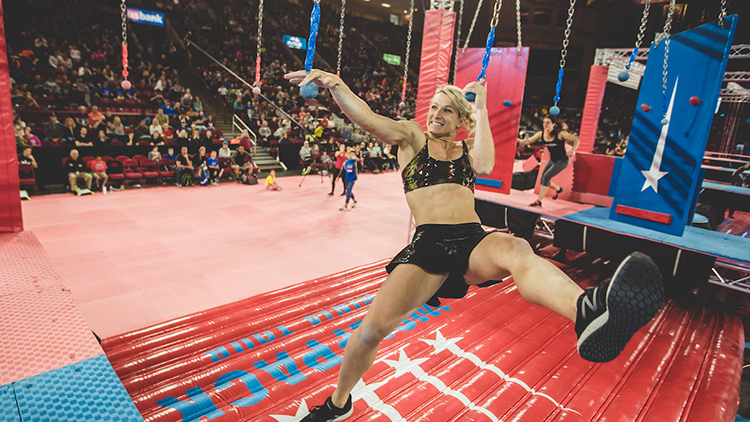 The Wolfpack Ninja Pro Team is already well known for their dominance on NBC’s American Ninja Warrior and Team Ninja Warrior, and have used that platform to introduce this exciting format and its benefits across a variety of sports. Ninja training develops myriad skills, including: speed, explosiveness, balance, strength and agility. The Wolfpack Ninja Tour is bringing fast-paced, adrenaline-pumping competition and unique coaching to venues all over the country, making Ninja Obstacle racing the new movement in sports training. Working with their charity partner, Positive Coaching Alliance (PCA), Wolfpack Ninjas will provide education, access and support to young athletes in order to maximize their opportunities in their favorite sports.